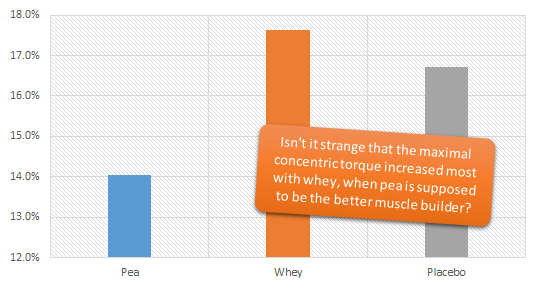 One study wouldn't be enough to prove that pea is superior to whey as muscle builder, anyways. In a recent study, French scientist investigated the effects of two types of protein supplementation on muscle thickness and strength in 161 moderate physically active (2–6 hours per week) male participants (mean age 22 years). More specifically, the scientists compared the effects of vegetable Pea protein (NUTRALYS®) vs. Whey protein and Placebo on biceps brachii muscle thickness and strength after a 12-week resistance training program. And as the headline already reveals: The pea protein had the upper hand, when it comes to biceps brachii size, but the way the gains were measured and superior strength gains in the whey group raise questions about whether the results of this study are practically relevant - meaning you have to switch from whey to pea. These values are based on measurements of arm circumference of the right arm which were taken using a constant tension tape during maximal elbow extension at rest and during a maximal voluntary contraction (with maximal elbow flexion). "All subjects followed the same training routine, three times per week with a rest day between each session. Training was based on three exercises involving the elbow flexor and extensor muscles. The exercises soliciting the flexor muscles were arm curl and lateral pulldown. In the arm curl exercise, subjects sat with weights in their hands with a ~40° trunk/arm angle. They had to flex/extend the forearm over the arm. For the lateral pull-down, subjects sat with a bar in their hands above the head. They had to flex/extend the forearm over the arm with a vertical movement. The exercise soliciting the extensors was the bench press. Subjects were lying on their backs with a bar in their hands with a 90° trunk/arm angle, arms extended, and had to flex and extend their upper limbs vertically. Throughout the training program, the number of sets was progressively increased from 2 to 5 while the number of repetitions was reduced in parallel from 15 to 5 repetitions maximum (RM). In the final week, the subjects did three sets of 5 RM in order to preclude any fatigue for the D84 tests" (Babault. 2015). Recovery between sets was identical for all workouts: 2–3 minutes. The load used for each exercise was regularly adapted during training depending on individuals’ maximum load (1-RM, one maximum repetition, evaluated every two weeks). Pea protein (PE) is similarly satiating as whey (WH) (Lang. 1998). Don't get me wrong: The fact that I put a huge "?" behind the assumption that pea protein was a better muscle builder than whey does not mean that I would go back on previous recommendation to use pea proteins if you don't want to use dairy protein supplements like whey or casein. They have a high amount of EAA and BCAAs and various of proven health benefits ranging from anti-inflammatory effects (albeit of yellow pea hydrolysate | Ndiaye. 2012) over similar gluco-regulatory effects as whey protein (Smith. 2012) to lipid reducing effects that have been confirmed in both rodent and human studies (Sirtori. 2012). Figure 2: Muscle thickness in the 3 groups at baseline after 42 and 84 days. There was only a trend (£) for increased gains in the pea protein group (Babault. 2015). Three measurements were made (at rest and contracted) along the length of the biceps, namely ¼, ½ and ¾ of the length of the upper arm (distance between the acromion process of the scapula and the lateral epicondyle of the humerus). Averaging was performed to obtain mean values for the circumference at rest and contracted. Faulty measurements due to messed up timing? That sounds great, but since the time of measurement is not mentioned, it may well be that all the values are fundamentally flawed. Why? Well, as a SuppVersity reader you know that even in leg muscles, which are muss less prone to "the pump", "Cell Swelling Keeps Muscles "Pumped" For More Than 52h. Size Increases of Up to 16% After a Single Leg Workout!" (learn more). Practically speaking, this means that the "size measurements" in the study at hand may be worthless if the scientists didn't wait for at least 72h-96h before they measured the sleeve sizes of their subjects. Don't trust sleeve size measurements, unless you know that they were taken at least 72h after the last workout. If they are taken before, the "gains" may well be a mere result of cell swelling. You don't believe that? Well reread my article "Cell Swelling Keeps Muscles 'Pumped' For More Than 52h. Size Increases of Up to 16% After a Single Leg Workout!" (read it). 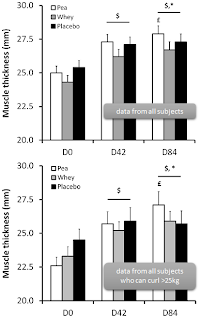 The absence of information on the time-point at which the sleeve sizes were measured (suggestive of immediately post) and the fact that the strength gains do not reflect the alleged superiority of pea protein as muscle builders (see Figure 3) put a huge question mark behind the assumption that pea protein tends to produce greater muscle gains than whey. Figure 3: It is strange that the "superior muscle builder" triggers the lowest gains in maximal isometric contractile force. Even the placebo group had greater strength gains - despite a lack of sign. differences at baseline (Babault. 2015). Rather than "gains", the increases could in fact be a result of increased inflammation and the reduced "gains" in the whey group a result of its anti-inflammatory effects (Buckley. 2010; Sugawara. 2012; Kerasioti. 2013). The existing evidence of anti-inflammatory properties of pea protein (Ndiaye. 2012) does yet render this assumption questionable. 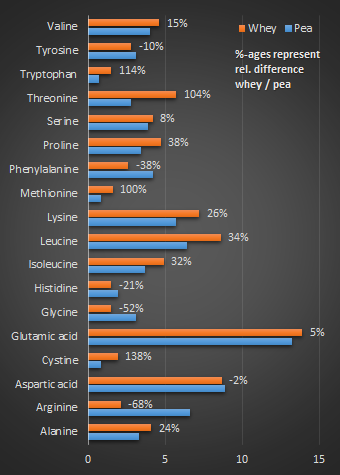 On paper, the amino acid profile of whey looks more anabolic (higher BCAA content). Overall, the study clearly indicates that pea protein is a good vegan replacement for whey protein. 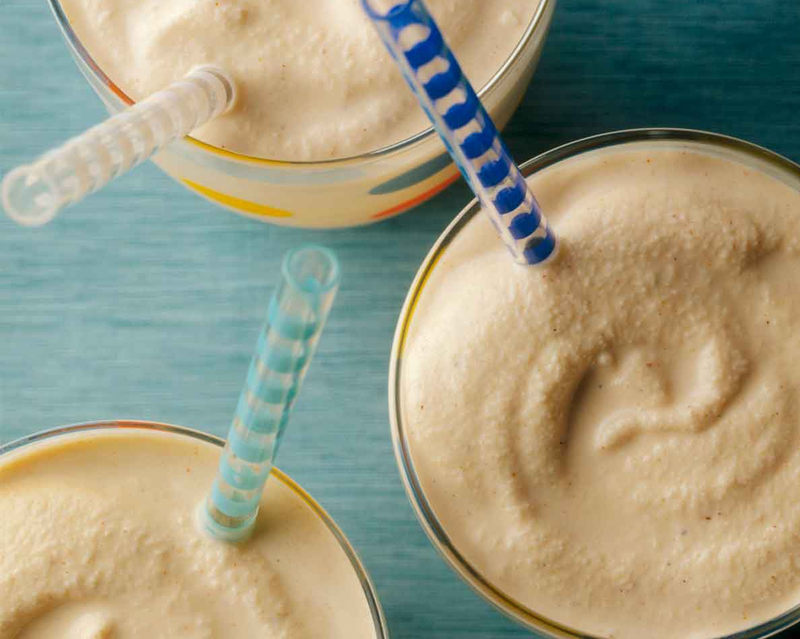 The assumption that it may be superior to whey protein, however, is questionable. First of all, the strength gains don't reflect these changes. In fact, the whey protein group saw the largest strength increases - as it was the case for the size gains, these differences were not statistical significant, though. If we also take into consideration that the "size" gains are actually gains in sleeve size (not reliable DXA measurements) which may have been taken way too early after the workouts to reflect actual muscle gains, we don't even have to raise the question whether the fact that the French company Roquette, the producer of NUTRALYS® pea protein, sponsored the study may have constituted an obviously subliminal bias ;-) Anyways, I would not yet replace my whey protein with pea protein isolates | Comment Facebook! Babault, et al. 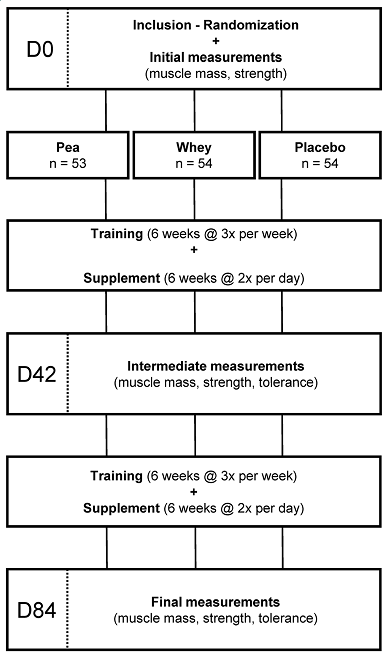 "Pea proteins oral supplementation promotes muscle thickness gains during resistance training: a double-blind, randomized, Placebo-controlled clinical trial vs. Whey protein." Journal of the International Society of Sports Nutrition 12:3 (2015). Buckley, Jonathan D., et al. 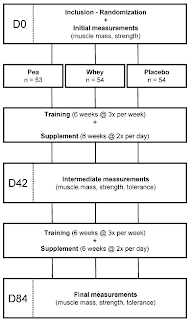 "Supplementation with a whey protein hydrolysate enhances recovery of muscle force-generating capacity following eccentric exercise." Journal of Science and Medicine in Sport 13.1 (2010): 178-181. Lang, Vincent, et al. 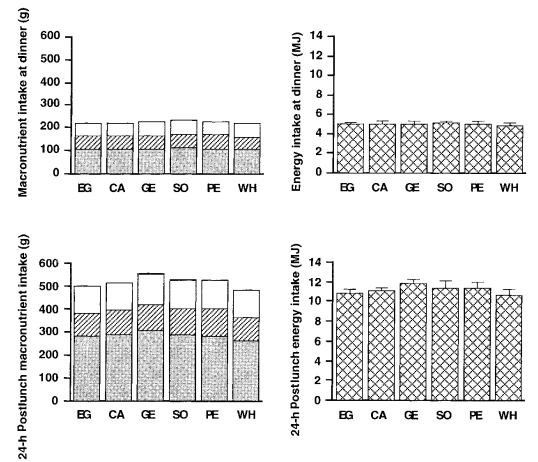 "Satiating effect of proteins in healthy subjects: a comparison of egg albumin, casein, gelatin, soy protein, pea protein, and wheat gluten." The American journal of clinical nutrition 67.6 (1998): 1197-1204. Ndiaye, Fatou, et al. "Anti-oxidant, anti-inflammatory and immunomodulating properties of an enzymatic protein hydrolysate from yellow field pea seeds." 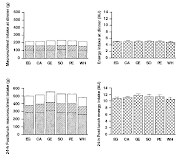 European journal of nutrition 51.1 (2012): 29-37. Kerasioti, Efthalia, et al. "Anti-inflammatory effects of a special carbohydrate–whey protein cake after exhaustive cycling in humans." Food and Chemical Toxicology 61 (2013): 42-46. Sirtori, Cesare R., et al. "Hypocholesterolaemic effects of lupin protein and pea protein/fibre combinations in moderately hypercholesterolaemic individuals." 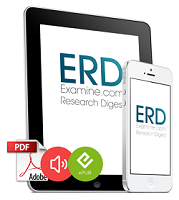 British journal of nutrition 107.08 (2012): 1176-1183. Smith, Christopher E., et al. "The effect of yellow pea protein and fibre on short-term food intake, subjective appetite and glycaemic response in healthy young men." British Journal of Nutrition 108.S1 (2012): S74-S80. Sugawara, Keiyu, et al. "Effect of anti-inflammatory supplementation with whey peptide and exercise therapy in patients with COPD." Respiratory medicine 106.11 (2012): 1526-1534.